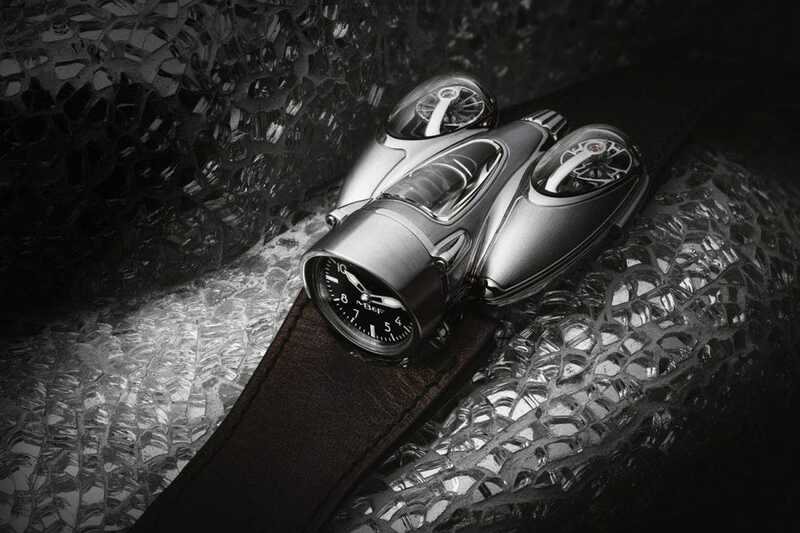 This timepiece is anything other than traditional – in fact MB&F’s entire collection of wristwatches has been anything other than traditional since the boutique brand’s inception in 2005. Yet, somehow, this watch even sets itself apart from the rest of Maximilian Büsser’s collection. Except for the HM4 – which, unlike its predecessors, their derivatives and the majority of what came after – actually looks like its inspiration was taken from a concrete object. Nicknamed the Thunderbolt, the HM4’s sleek aerodynamic titanium-and-sapphire-crystal case was inspired directly by aviation. This form’s roots could be found in Büsser’s childhood passion for assembling model airplane kits (though certainly none of those looked remotely as futuristic as the HM4). And neither does any other watch on the market, really. Büsser conceptualized the look of the HM4 Thunderbolt, while well-known watch designer Eric Giroud was responsible for its final industrial design. 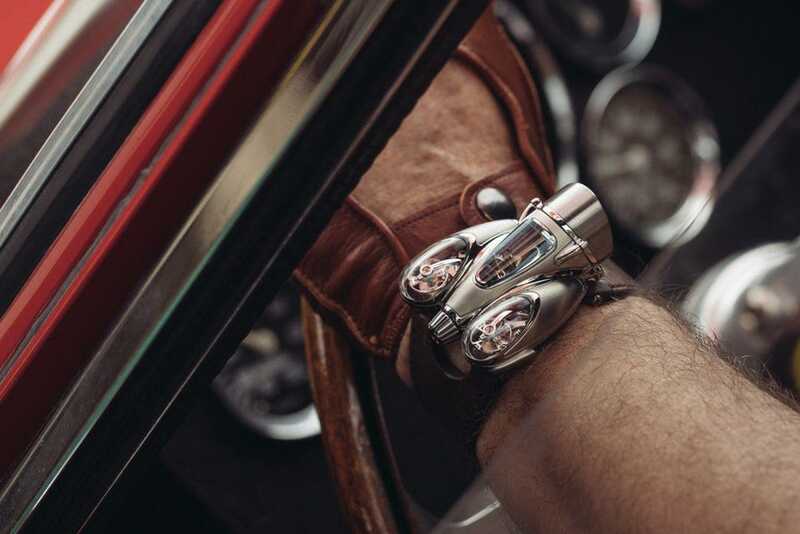 Büsser and Giroud teamed up again to determine the look of the HM9, which is not terribly far from the ideas of HM4, though it is taken further into the idea of being futuristic while also offering inspiration from mid-century automotive and aviation concepts. 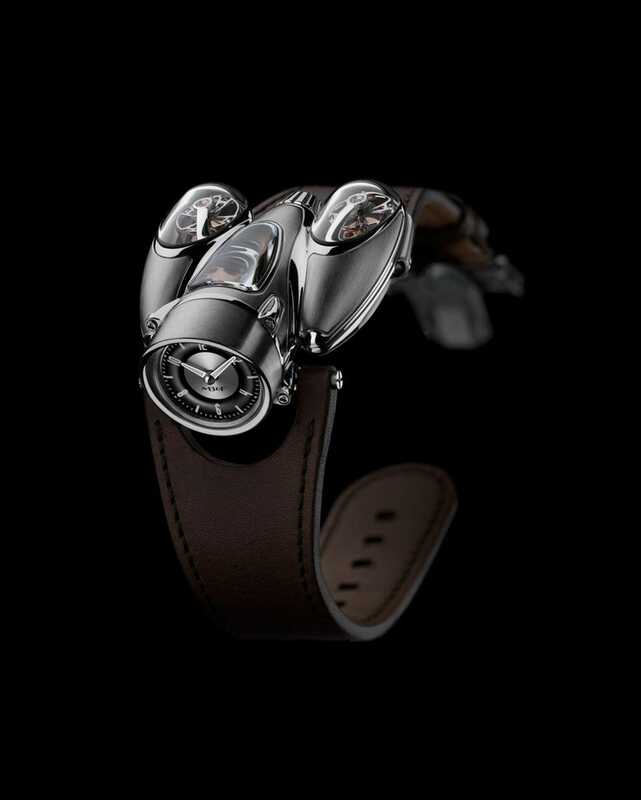 Its look is solidly reminiscent of a jet engine, successfully failing to reveal at first glance how complex the titanium case is with alternate polished and satin finishes, five panes of impossible-to-machine sapphire crystal in varying sizes and shapes, and an unprecedented, patented, three-dimensional gasket to ensure water resistance, thereby making it wearable. This audacious timepiece measuring 57 x 47 x 23 mm with its dramatic geometry takes everything further that the HM4 brought to the table. HM9’s manually wound movement is no less complex than its 43-component (!) 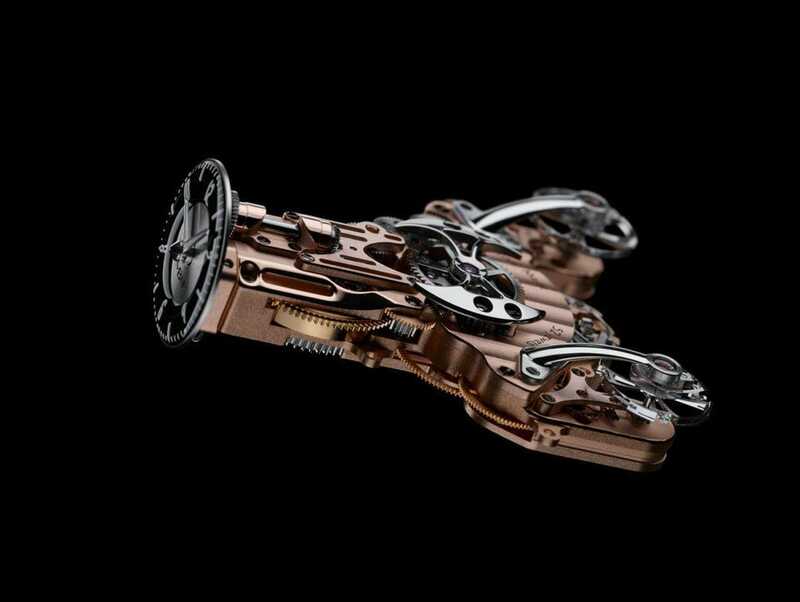 case: needing three years of development, this technical delicacy comprising 301 parts was completely created in-house at MB&F. And make no mistake: this movement looks nothing like any other watch movement you’ve ever seen (with the exception of that found within the HM4, which bears a slight resemblance due to the watch’s somewhat similar shape). When you delve into the details, it becomes obvious that HM9’s movement has been freshly designed and manufactured – including twin “flying” balance wheels visible through each of the sapphire crystals on the tails of the two “thrusters” or “air scoops” (depending on how you’d like to interpret the design). The two balance wheels, connected by a central planetary differential gear, are individually impulsed and set to beat independently at a frequency of 2.5 Hz. The differential averages their rates to achieve the most precision possible. This seems a bit excessive for a time-only watch, but then again so is the entire concept of the 33-piece limited edition available in two different color schemes retailing at a price of $182,000, is it not? With so many details to look at on this timepiece – which could literally be called a sculpture that happens to tell the time – you might say being able to see the (precise) time is a fringe benefit to admiring the skillful design of this most unusual wristwatch. Elizabeth Doerr is the editor-in-chief of Quill & Pad, a publication that keeps a watch on time.